As cybercriminals have started using sophisticated phishing techniques in an attempt to hijack online users’ account, Google on Wednesday launched a new Chrome Extension to fight against Phishing. The search engine giant has launched a new Password Alert Chrome extension that will alert you whenever you accidentally enter your Google password on a carefully crafted phishing website that aimed at hijacking your account. So, GO and INSTALL the freely available, open-source Password Alert extension which is now available in the Chrome Web Store. Prevents you from re-using your Google account password on other websites. Protects you if you've typed the same Google password on a non-Google website by generating a warning that you have just been phished and should immediately change your password. According to the company, nearly two percent of the e-mail messages to Google's Gmail are phishing emails from cyber criminals where they aim to fool users into giving up their credentials. Once installed and initialized, Password Alert extension stores a "scrambled" version of your Google account password in an encrypted cryptographic hash format. Password Alert works for both Google and Google Apps for Work, providing an additional layer of security for Google's enterprise clients. Install Password Alert extension from the Chrome Web Store. 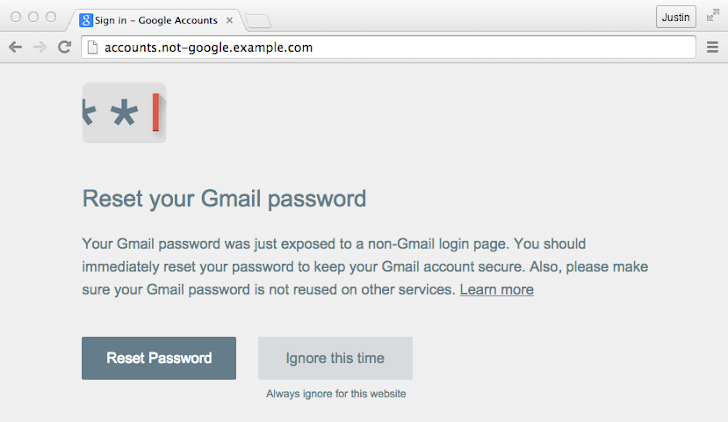 Password Alert prompts you to enter your Google account’s username and password, even if you are already logged in. Once you entered the credentials, Password Alert will start monitoring where you enter your Google password. Google also allows its users to see all the devices that have access to their Google accounts and lets you change their passwords or log out remotely using a single online dashboard. The source code of the new Password Alert extension is available on GitHub, and there is a pre-built copy of the server. So, now it is time to protect your Google Account with the new Password Alert Chrome extension. NOTE: These are bunch of Android apps that I used in my smartphone to protect data and privacy of my phone. If you have some even good alternatives that you found comfortable and more secure, feel free to share with us.